Milan (population 5,099) is located in Rock Island County within the Quad Cities metropolitan area in northwest Illinois, located south of Rock Island. The Rock River runs through the north side of town, which can also be accessed through Interstate 280, U.S. Route 67 and the newly-minted Milan Beltway. The town was originally called “Hampton” and then “Camden” (after the previous was confused with a similar settlement within the county), according to an 1908 History of the county. George Camden and Franklin Vandruff were early settlers of the area, which was renamed Milan at a later date. The high school in Milan may have started during the 1860s, and continued in some capacity leading up to the 1900s. High schools back then were incorporated within the grade school system in one building, and for many young men and women at the time continued education through the high school education was mostly optional. One of Milan's most prominent families is that of Vandruff. Descendants of one of Milan's founding fathers have attended the Milan High School, including grandson C.H. Vandruff (as noted in a biography in the 1891 History of Pottawatamie County, Iowa). The Milan School held high school classes for at least the ninth, tenth and eleventh grades (whether a twelfth-grade class was offered is unknown to us at this time). It was located on the northeast corner of Dickson and 5th Streets (now 2nd Avenue and 2nd Street). By the 1910s, many schools were facing financial and maintenance difficulties, and a more state-wide educational structure was put in place. The Milan school wasn't able to hold high school classes by the 1910s. By 1915, all high school-aged students were sent to Rock Island High School. Milan's school district has since consolidated with Rock Island's. 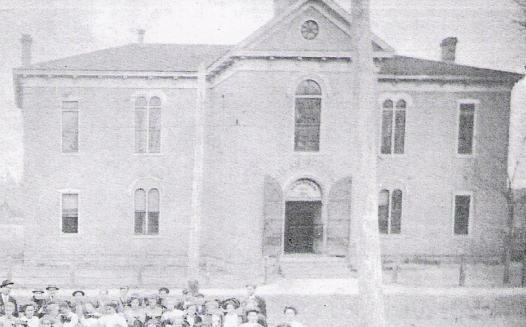 The building that housed both the high school and grade school was torn down in 1915, and was replaced with a two-story brick building. This building served students until the 1990s, but a newer elementary school south of town (Thomas Jefferson Elementary) continues to educate the youth of Milan. The 1915 building still stands and is in private use. Because of the major growth of the Rock Island and Milan area during the post-war era, talks of creating a separate high school for Milan once more began to take shape. However, such plans never materialized and the area population has since decreased. H.S. Students now attend: Rock Island H.S. Because of the era of existence of Milan High School in Illinois, the school may not have offered interscholastic athletics for its students. Most “small” high schools did not field athletics until the late 1910s and early 1920s. However, if there is any evidence of high school sports offered at Milan H.S., we welcome such information. Likewise, there may have been many other "extra-curricular" activities were offered as part of the educational plan too. FFA, FHA, GAA, band, chorus, and many other events probably helped to make the Milan school a special one. We would like to thank the Rock Island County Historical Society for assisting us with the information provided on this page for Milan High School. Much of the information comes from a history book titled Travels in Time by Barbara Scott (1982). Not every small town in Illinois was able to put a comprehensive history of its boundaries together. The efforts of Ms. Scott in preserving Milan history made it possible for the history of Milan High School to be uncovered for the next generation. Do You Have Information to Share About Milan High?